Artist and playwright Maribel Acosta was born in Havana, Cuba in 1969. She emigrated in her twenties to Ecuador and since 2010 has been living in the Lowcountry with her family. She has gained a reputation within the local arts community for her paintings, graphic design, community based theatrical productions, and community service. Selection from interview with Maribel Acosta by Marina López, 11 November 2013, courtesy of The Citadel History Program, Lowcountry Digital Library. Clip from original interview minutes 52:00-01:03:25. To access the full oral history and transcript, click here. 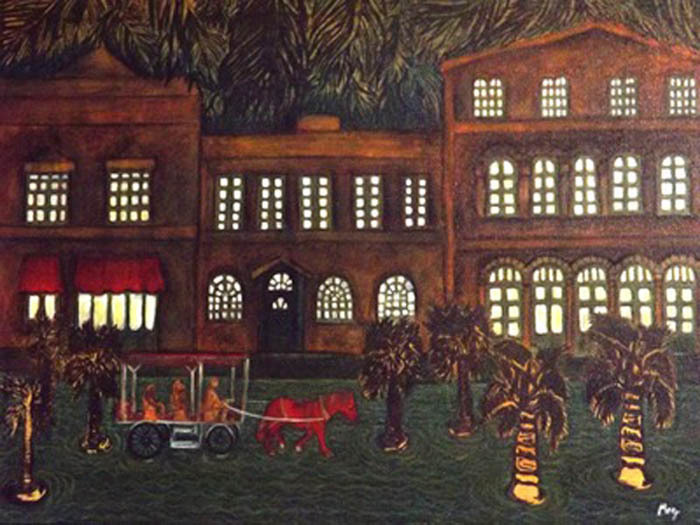 A Present that Recalls a Past in Another Latitude, painting by Maribel Acosta, Charleston, South Carolina, 2013. Maribel Acosta: My children have settled in and have also grown up more. They’re more independent. So it’s time for me to say, “Well, now I’ve got to think about my next step because any day now they’ll be completely independent and ready to live on their own.” So I have to start. I can’t wait too long to start over. So that’s how I decided, when I had more time, I started to paint. I felt like painting and I said, “I’d better start with something I like,” because being at home with the kids limited my English learning. Because I didn’t interact with people, I had no need to speak it, and I couldn’t read it. When I speak it no one can understand me because I can’t pronounce words. I say things the way they’re written, so I’m a mess. I forget things, so I thought that painting would be the best way to express myself because it doesn’t involve speaking. So I started painting little by little because paintings are expensive, and right now we only have one breadwinner, so I’m working on a limited budget. So one tube of paint every two weeks, and in that manner, little by little, I had an exhibit in the main library downtown. Marina López: How did you manage that with your limited English and tight budget? How did you find that door and the way to exhibit your work? How did that happen? ML: You went by yourself. MA: Well, one of the gallery’s partners was Venezuelan. He’s no longer a partner, but at least spoke Spanish, so he left me alone with the girl. Gino [Castillo] also came with me because I was using hand gestures and the words I had learned, and she would laugh. One thing about the art world is that sometimes you don’t have to speak much. She’d only say, “I like it,” and via email things were easier because I can write. We’d communicate and I’d send her my resumé and what she asked for, and in that way we agreed to a date. As for the exhibit at the main library, everything happened through networking, right? Someone who worked there heard my husband play and knew through Facebook that I paint and sent me a message on Facebook saying, “Hey, why don’t you apply? Because I really like what you do and here at the library, there will be a call for art work next year. Why don’t you apply?” So I said, “Oh, yes, of course,” and I even forgot because I was working on something else at the moment. She messaged me again, “the deadline is coming up. Have you applied?” I said, “Thanks, thanks,” and a while back I applied. I got the acceptance package two days ago, and in February is my exhibition. It’s good because you succeed just as much little by little. I have a project that has just started. In other words, it’s still in its infancy, but we’ve met up twice as a team. It’s a play with some music. There will be two musicians, and there will be actors, and the story is going to be about, I’m writing it, three cultures that coexist at the moment. The most important one is Latin culture because it’s on the rise. I use Latin because I don’t want to exclude Brazilians, which is why I don’t use Hispanic. Latin, Afro-American, and Caucasian. So I’ll tell you just a small piece, just the basic concept. Just to give you a feel for it. It begins with a place that all three will eventually reach, at different moments. They will enjoy the space, and then get off the stage, but at some point, they will get to the space at the same time, but instead of settling in, they push one another, and at that point the play begins. The play unfolds by showing how each person got to that point, and showing whether anyone has more rights than anyone else, and the differences and similarities among their stories. ML: There’s also a radio project, right? MA: Oh, yes, the radio project. I’d forgotten. ML: How did the project "Hola Familia" [“Hello Family”] come about? MA: The “Hola Familia” project practically happened by chance. I met Lydia Cotton one day, and she told me that she had a radio program. One day, we were talking about my experience as a teacher and bla, bla, bla, so she said, “Well, you have many things to say. Wouldn’t you want to have a segment on the radio?” I said, “Oh, yes.” “Would you be up to it?” or something like that, and I said, “Yes, let me try. Let’s do it.” Because my husband is a musician and has his own sound program, he said, “let’s record it here and send it already recorded. Let’s see how it goes.” I love doing voices and what not. Years ago in Ecuador I was in a very successful show for a year, “The Little Prince,” and I was the prince. At the beginning of the play, he was a hand puppet and kept growing into a large puppet, and finally I was dressed as the puppet, with the same costume and hair and makeup. That lasted for a whole year, so the Little Prince stayed in my mind. After that, I was asked to do some shampoo commercials with the voice of the Little Prince. So I wanted to use that character. I created a character with the voice I used for the Little Prince called Pedrito. I love writing stories for children, whether it be narrating them, acting them out, etc. Sometimes I put—when the children were little, I’d play the witch and the princess and the prince and elves and all that. So I couldn’t help myself and said, “I’m going to do the program, but I’ll add a character.” I really like to read, so I included what I knew and my own experience. I included what I read and what I found, so I said, “I can create a theme and interview people” So I’d read it to my son for fifteen to twenty minutes. I’d send it. He liked it and we kept reading, so Gino thought we’d create a web page. ML: Could you describe the program a little for those who don’t know it? MA: Well the idea behind “Hello Family,” was to be able to communicate with family, with parents, grandparents, the whole family and talk about topics that interest all of us but perhaps aren’t spoken about because—let’s see. For the first show, no the second one, we assumed that everyone knew how children should play and know how to play—things that we assume but don’t talk about. So I said—Lydia [Cotton] told me, “All those things that you tell me,” because I’d sometimes tell her things. I’d tell her about the children. I loved talking about class, “Why don’t you include them in the program?” So I tried looking for topics that reflected some sort of experience I’d had and tried to transmit that. The idea is to communicate, but that they also communicate. That has been hard to do. People like us. They say that they like us, so we haven’t given up yet. We’ll reach a point in which we’ve addressed all the topics I find important. There are other topics that are important to others that I haven’t considered. I’d like them to share those with us, but they still haven’t. ML: It's too soon, perhaps. So for now I’m dealing with topics that I consider important related to children’s education, and I hope that at some point people say, “Look, why don’t you talk about this,” or “I want to talk about such and such,” because the point isn’t for me to be there. In fact, they’ve asked me to stay on longer, but I don’t want to because I don’t want to be the only one speaking. I want other voices to be heard and other topics discussed.